MB Krueger: Bio & Choral Music | Santa Barbara Music Publishing, Inc.
MB Krueger is the Associate Director of Choral Activities at Metropolitan State University of Denver, where she directs the Women’s Choir, Men’s Choir, and Auraria Chorale and teaches all levels of undergraduate conducting. She earned her bachelor’s degree in music education at Michigan State University, where she was a National Merit Scholar, and her master’s degree in music education with a focus on conducting from Miami University in Oxford, Ohio. 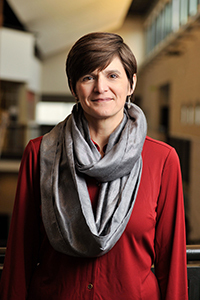 Professor Krueger is the Women’s Choir Repertoire and Standards Chair of the Colorado chapter of the American Choral Directors Association, and has also been the Newsletter Editor of that organization. She regularly presents at the annual CoACDA Summer Workshop. She is also active as a clinician for middle school, high school, and college choral festivals, as well as regularly presenting vocal and choral workshops for amateur singers in theatre and church programs. She is a professional singer with St. Martin’s Chamber Choir and St. Andrew’s Episcopal Church Choir, both of Denver, Colorado, and has also sung professionally with the Santa Fe Desert Chorale, the Santa Fe Opera, the Baroque Chamber Orchestra of Colorado, and others. MB Krueger has 1 titles published with Santa Barbara.